Being a parent is not easy today. There are many curve balls thrown our way that makes the daily investment in our children seem overwhelming. We do live in a very troubled world and it is only by God's grace that we see our children protected and equipped to meet it head on to God's glory. I have five sons and daughters who are no longer kids, but teenagers or young adults. This time in their lives is very exciting, yet so unpredictable. Their bodies and emotions are changing at the speed of light; they are struggling to "find themselves"; wanting their freedom; and at the same time desiring to please their parents and live for the Lord. It is a crucible of grace we find ourselves in each day. I pray for wisdom every day to give them the space they are wanting to discover new things in their world, but with the discipline and boundaries they so desperately need and may not recognize or desire. 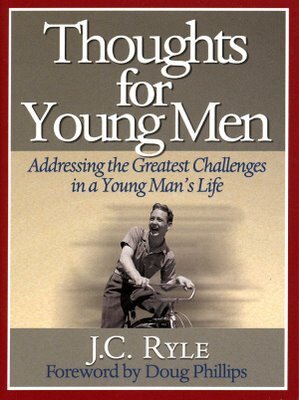 To that end, I came across this powerful book by J.C. Ryle entitled, "Thoughts for Young Men." It is an excellent collection of practical biblical wisdom from the heart of a father to his sons (though in principle, they can be applied from "a mother to their daughters" as well). I offer it to you today that J.C. Ryle's words may encourage you as parents in the discipleship of your children. I know that I certainly haven't arrived at this in my life; but what a great Lord we serve who knows the hearts, minds, dreams, desires, longings, struggles, frustrations and contentments of all our children. May we offer them afresh everyday to the Lord and His sovereign purpose for each of them. There are some special dangers that young men need to be warned against. One danger to young men is PRIDE. I know well that all souls are in fearful peril. Old or young, it doesn't matter; all have a race to run, a battle to fight, a heart to humble, a world to overcome, a body to keep under control, a devil to resist; and we may very well say, Who is sufficient for these things? But still every age and condition has its own peculiar snares and temptations, and it is well to know them. He that is forewarned is forearmed. If I can only persuade you to be on your guard against the dangers I am going to name, I am sure I shall do your souls an essential service. Pride is the oldest sin in the world. Indeed, it was before the world. Satan and his angels fell by pride. They were not satisfied with their first situation and status. Thus pride stocked hell with its first inhabitants. Pride threw Adam out of paradise. He was not content with the place God assigned him. He tried to raise himself, and fell. Thus sin, sorrow, and death entered in by pride. Pride sits in all our hearts by nature. We are born proud. Pride makes us rest content with ourselves--think we are good enough as we are--keep us from taking advice--refuse the gospel of Christ--turn every one to his own way. But pride never reigns anywhere so powerfully as in the heart of a young man. How common is it to see young men with big heads, high-minded, and impatient of any counsel! How often they are rude and uncourteous to all around them, thinking they are not valued and honored as they deserve! How often will they not stop to listen to a hint from an older person! They think that they know everything. They are full of conceit of their own wisdom. They think elderly people, and especially their relatives, are stupid, and dull, and slow. They want no teaching or instruction themselves: they understand all things. It almost makes them angry to be spoken to. Like young horses, they cannot bear the least control. They must be independent and have their own way. They seem to think, like those whom Job mentioned, "You are the people, and wisdom will die with you" (Job 12:2). And all this is pride. Rehoboam was such a person, who despised the counsel of the old experienced men who stood before his father, and listened to the advice of the young men of his own generation. He lived to reap the consequences of his folly. There are many like him. The prodigal son in the parable was also such a person, who needed to have his share of the inheritance so he could set himself up in the lifestyle that he desired. He could not submit to live quietly under his father's roof, but would go into a far country, and be his own master. Like the little child that will leave its mother's hand and walk alone, he soon feels the sting for his folly. He became wiser when he had to eat husks with the swine. But there are many like him. and the other is an old man that is content. I fear that this is only too true. Do not be proud of your own abilities, your own strength, your own knowledge, your own appearance, your own cleverness. Do not be proud of yourself, and your endowments of any kind. It all comes from not knowing yourself and the world. The older you grow, and the more you see, the less reason you will find for being proud. Ignorance and inexperience are the pedestal of pride; once the pedestal is removed--pride will soon come down. Remember how often Scripture sets before us the excellence of a humble spirit. How strongly we are warned "Do not think of yourself more highly than you ought" (Romans 12:3). How plainly we are told, "The man who thinks he knows something does not yet know as he ought to know!" (1 Corinthians 8:2). How strict is the command, "Clothe yourselves with humility" (Colossians 3:12). And again, "Clothe yourselves with humility" (1 Peter 5:5). This is the garment of which many seem not to have so much as a rag. Think of the great example our Lord Jesus Christ leaves us in this respect. He washed the feet of His disciples, saying, "You should do as I have done for you" (John 13:15). 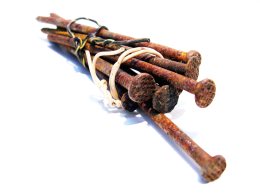 It is written, "Though he was rich, yet for your sakes He became poor" (2 Corinthians 8:9). And again, "He made Himself nothing, taking the very nature of a servant, being made in human likeness. And being found in appearance as a man, He humbled himself" (Philippians 2:7, 8). Surely to be proud is to be more like the devil and fallen Adam, than like Christ. Think of the wisest man that ever lived--I mean Solomon. See how he speaks of himself as a "little child," as one who "does not know how to carry out his duties" or manage for himself (1 Kings 3:7). That was a very different spirit from his brother Absalom's, who thought himself equal to anything: "If only I were appointed judge in the land! Then everyone who has a complaint or case could come to me and I would see that he gets justice" (2 Samuel 15:4). That was a very different spirit from his brother Adonijah's, who "exalted himself, saying, I will be king" (1 Kings 1:5). Humility was the beginning of Solomon's wisdom. He writes it down as his own experience, "Do you see a man wise in his own eyes? There is more hope for a fool than for him" (Proverbs 26:12). Young men, take to heart the Scriptures just quoted. Do not be too confident in your own judgment. Stop being so sure that you are always right, and others wrong. Don't trust your own opinion, when you find it contrary to that of older men, and especially to that of your own parents. Age gives experience, and therefore deserves respect. It is a mark of Elihu's wisdom, in the book of Job, that "Elihu had waited before speaking to Job because they were older than he" (Job 32:4). And afterwards he said, "I am young in years, and you are old; that is why I was fearful, not daring to tell you what I know. I thought, 'Age should speak; advanced years should teach wisdom" (Job 32:6-7). Humility and silence are beautiful graces in young people. Never be ashamed of being a learner: Jesus was one at twelve years; when He was found in the temple, He was "sitting among the teachers, listening to them and asking them questions" (Luke 2:46). The wisest men would tell you they are always learners, and are humbled to find after all how little they know. The great Sir Isaac Newton used to say that he felt himself no better than a little child, who had picked up a few precious stones on the shore of the sea of knowledge. Young men, if you would be wise, if you would be happy, remember the warning I give you--Beware of pride. I love reading J. C. Ryle. His blend of words with Scripture truly grips my heart, and stimulates my mind. Thanks for another fine post to study. Pride does rule the hearts of men. But our heavenly Father, is greater than our hearts, and knows how to humble His children. And His grace is always sufficient to deal with our pride, and cloth us in His humility. This book is one of my favorites; excellent choice. I must say, however, that I know several young women who also greatly value this work, as well as older men, etc. This book is definitely not limited to the younger men alone. You can read this entire work (it isn't long) HERE. Thank you for this post and for the book recommendation. As a mother of four boys, ages 1, 3, 6 and 9, I am always on the lookout for wisdom from those who have been there! God bless! Interestingly enough, I saw a copy of this book in a bookstore recently, and I paused to thumb through it. I made a mental note that I should pick up a couple of copies later for my two boys when they are a bit older. However, (as is too often the case for this scatterbrain) it had slipped my mind until I saw your post on it this morning. Thanks for helping bring that back to my mind. I'm going to order some hardback editions for my sons and put them away until the boys are ready for them. (for they will someday be the leaders of our churches & our families). May our young men grow up to one day bear the unmistakable marks of men of God. I so love this book. We have recently gone through it with my older 2 boys and will go through it again in a couple of years. They are going through "Don't Waste Your Life" with Piper right now. I also have 4 boys (and 2 girls). Twins that are 4 years old as well as one almost teen and one pre-teen. This Ryle book is a must-read... more than once. is 35 considered 'young men' age? Both of my boys, ages 11 and 12, just went through this for a school assignment. I happen to be their teacher (at home) so I am able to choose great works such as this one. J.C. Ryle has a way of speaking that draws even a child's attention. I recently purchased this book for my son who is soon turning 14. He told me that it is easy to understand even though it is "old"(his words). He even thanked me for it. I am grateful for the work of grace God is doing in my son and grateful for this classic. Yes this book is great, and JC Ryle is a straight to the point and straight at your heart writer. (I believe most people like those people only when their dead). 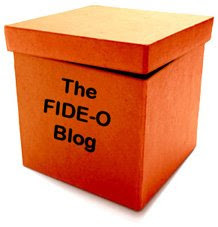 Please read my blog. I'm just getting started but I would gladly appreciate some support. Please stay tuned. God bless you.